We stopped at Grand Turk today. We have visited many beautiful islands, however Grand Turk is by far the most beautiful. I have never seen water as turquoise blue as it was around this island. The water was so clear you really could see to the bottom of the ocean. We went on a snorkeling excursion today. We snorkeled in about 30 feet of water and there was a shelf that dropped off to 7000 feet. It was amazing how the turquoise blue water turned to a deep blue color when you swam past where the shelf ended. The fish were more plentiful in St Thomas but there were many different types of coral in Grand Turk. After snorkeling we were taken to a beautiful white sand beach. It was here that I found my most prized possession, a piece of brain coral. I have been told that I won’t be able to get it through customs. However, I hope I can. I included a picture of it in the blog in case I never get to see it again. 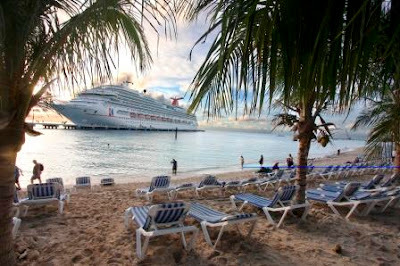 The island of Grand Turk is surprisingly small 7 miles by 1 mile. Despite its natural beauty most of the island still is devastated from Hurricane Ike. According to our ship mates, in the residential area houses are still in ruin and cars and ships are still flipped over and misplaced. There was some good shopping in Grand Turk and we enjoyed looking at things however, maybe we had too much fun. We had to be back on the ship at 5:30. According to Esteban’s watch it was 5:25 when we were walking down the dock. However they started pulling the planks in. We quickly ran and got onto the boat and when we had our cards scanned they said, “Everyone is back on the boat now”. The time on the boat was 5:38. So long story short we sped up the time on Esteban’s watch. Grand Turk was a beautiful island but I am very thankful that we were not stranded there. 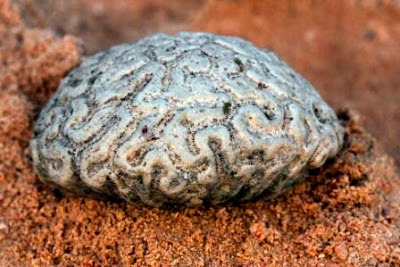 If I only had a brain (coral) . . .